The Lawrence Joel Veterans Memorial Coliseum (also known as LJVM Coliseum, Joel Coliseum or simply The Joel) is a 14,407-seat multi-purpose arena, in Winston-Salem, North Carolina. Construction on the arena began on April 23, 1987 and it opened on August 28, 1989. It was named after Lawrence Joel, an Army medic from Winston-Salem who was awarded the Medal of Honor in 1967 for action in Vietnam on November 8, 1965. The memorial was designed by James Ford in New York, and includes the poem "The Fallen" engraved on an interior wall. It is home to the Wake Forest University Demon Deacons men's basketball and women's basketball teams, and is adjacent to the Dixie Classic Fairgrounds. The arena replaced the old Winston-Salem Memorial Coliseum, which was torn down for the LJVM Coliseum's construction. The LJVM is home to the Wake Forest University men's and women's basketball teams, but other basketball games are held there, such as the Frank Spencer Holiday Classic basketball tournament, an annual event for high school basketball teams in the area. Since 2003, the LJVM has hosted the North Carolina High School Athletic Association (NCHSAA) Western Regional Basketball Tournaments. The LJVM was the site of the Central Intercollegiate Athletic Association (CIAA) basketball tournament from 1994 to 1999. Also, the first and second rounds of the NCAA Men's Division I Basketball Championship have been held at the Coliseum four times (1993, 1997, 2000 and 2007). It also hosted the MEAC Men's Basketball Tournament from 2009 to 2012. In a memorable NCAA second-round game at the Coliseum on March 15, 1997, North Carolina gave head coach Dean Smith victory number 877, surpassing Kentucky legend Adolph Rupp as the winningest college basketball coach in history. The Harlem Globetrotters have played in the Coliseum as well. By 1993, the LJVM had replaced the Greensboro Coliseum as the arena for visits from World Championship Wrestling in the area. It hosted the annual Fall Brawl pay-per-view event from 1996 to 1999 which also featured the WarGames matches from 1996-1998. The arena has hosted concerts by many famous artists, spanning many different genres. The LJVM's amply large size makes it an ideal location for performers who wish to perform at smaller venues. The main arena can also be curtained off to create a theater-like setting. The LJVM has played host to large-scale events such as the quarterfinals of the 2007 Davis Cup, but has also hosted racing, bull riding, circus, religious conferences, conventions and other events. The movie The Longest Ride filmed a bull riding scene at the Coliseum in August 2014. Barney performed here in 1998 in his first National Tour: "Barney's Big Surprise". The show was filmed here and was later released as a VHS tape. In addition to its main arena, the LJVM also has an Annex; it seats about 4,000, and is used primarily for hockey, but also for basketball, concerts, trade shows, and other events. The Winston-Salem State University Rams play basketball in the annex. There is also an Education Building available for additional floor space; both buildings are technically located on the Dixie Classic Fairgrounds. Wake Forest University BB&T Field along with its Deacon Tower and Gene Hooks Field at Wake Forest Baseball Park, a baseball stadium, is also considered part of the complex. Bowman Gray Stadium, though not in the vicinity, is technically part of the complex as well. All these buildings combined make up the Winston-Salem Entertainment-Sports Complex, which, with the exception of Bowman Gray Stadium is bordered by University Parkway, 27th Street, Deacon Boulevard, and Shorefair Drive. BB&T Ballpark has replaced Gene Hooks Field in downtown at the intersection of Business 40 and North Carolina Highway 150. On May 20, 2013, the Winston-Salem city council approved the sale of the Joel Coliseum to Wake Forest University for $8 million. 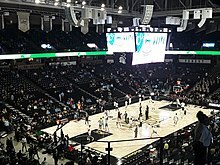 Wake Forest might consider buying the naming rights to the arena as well, which is currently owned by the city. Wake Forest University completed the purchase of Lawrence Joel Veterans Memorial Coliseum and the surrounding 33 acres on August 1, 2013. Wake Forest plans on making improvements and repairs to Coliseum, according to its Athletic Director Ron Wellman. ^ Associated Press (August 1, 2013). "Wake Forest buys Joel Coliseum". ESPN.com. Retrieved August 2, 2013. ^ "WSSU Homecoming 2006: Ludacris with Special Guest Yung Joc". Eventful.com. Retrieved 17 September 2016. ^ "Local organizations offered money to provide extras for 'The Longest Ride'". Myfox8.com. 6 August 2014. Retrieved 17 September 2016. ^ "City Council OKs sale of Joel Coliseum". Winston-Salem Journal. May 21, 2013. Retrieved May 21, 2013. ^ "Wake Forest's purchase of Joel Coliseum officially completed". Winston-Salem Journal. August 1, 2013. Retrieved August 2, 2013.